Hello Friends, it's Friday and the weekend is finally upon us! Hope your Friday is off to a great start. I am sharing a card I created using Party Girl Ellie over on the paper nest dolls blog. She is super cute, I just love her hair. This image is perfect for all types of celebrations. I wanted to create a fun celebratory card so I used the Echo Park party time collection to create my card. I just love this collection and was perfect for this cute image. I used copics to color this cutie up and I die cut the image out using a stitched rectangle die from my stash. I added some nuevo crystal drops to the front for added dimension. I added the sentiment "Make a wish" from the paper collection to this card. Well I hope you like the card and it provides you with inspiration to create something with PND images. Definitely check out the store for all of the cute stamps. Have a great Friday, and we will chat again soon. Good Morning friends, I have a card share for you today. We are gearing up for Spring over on the Crafty Sentiments Designs Challenge blog this week. Yes, spring is just around the corner and I can't wait. I love the longer days, more sunlight for me. For today's card I am using Spring Breeze , I love this stamp. She is so CHIC and sassy, I can relate for sure lol. I created a cross-cross pocket style card. I colored her up using my copics and cut her out using a stitched oval due from my stash. 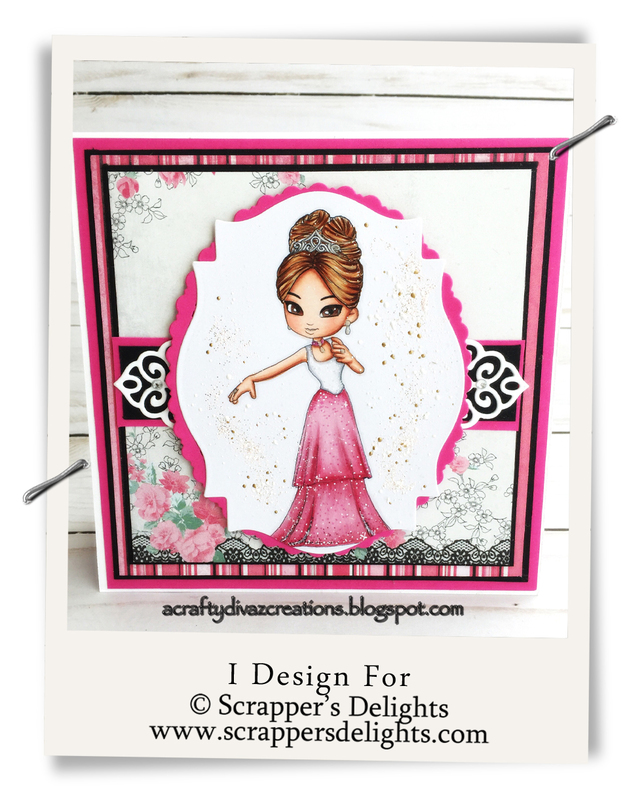 I added frontage around the stamped image and layered the image on a scalloped oval die cut. I used DSP from my stash to create this card. I added some lace to the bottom of the card along with the flower border at the top. She is definitely spring ready and so am I. Head over to the blog and check out the challenge. Make sure you link up your projects that is SPRING. Don't forget to check out our FB challenge too "SPRING" (with a crafty sentiments image) Crafty Sentiments Designs Group. That's all for today, thanks for stopping by, leave a comment and let me know what you think of this card. Have a fabulous Tuesday! Good Morning crafty friends, yep its MONDAY again! Time flies right over the weekend and we are back to another work week. Hope you had a great weekend and was able to get some crafting done. I got a little crafting in among all of the other things I needed to do. I created a card using the new digi stamp Bonjour Anya from The Greeting Farm. 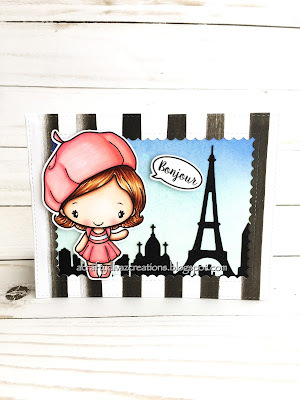 I used tumbled glass distress ink to create the background and added the paris skyline die from MFT. I used the mama elephant park avenue die to frame the card. I cut out the image using my brother scan and cut and colored her up with copics. The sentiment comes with the digital stamp and I added that to finish off the card. Well that's all I have for you today, leave a comment and let me know what you think of the card. Until next time, have a Fabulous Monday! Good Morning Crafty peeps, It's Thursday!!!! I can see the weekend around the corner, its been a long week for me. 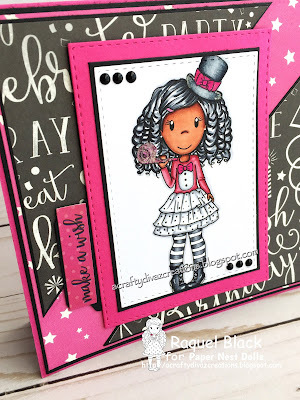 I have a card share for you today, featuring Rainy Day Emma digital stamp from the Paper Nest Dolls new release this month. I needed to make a Get Well card for a friend and decided this cutie was perfect image to add to the card. I printed the image out on copic x-press it blend card stock and used my copics to color. I used the doodle bug bunnyville designer papers for this card. I die cut the clouds out and the sentiment "under the weather" to add to this card. I love the way this card turned out, very springy. That's all I have for you today, thanks for stopping by. Hope you have a Happy Crafty Thursday. Hello my friends, hope you are having a great Thursday so far. 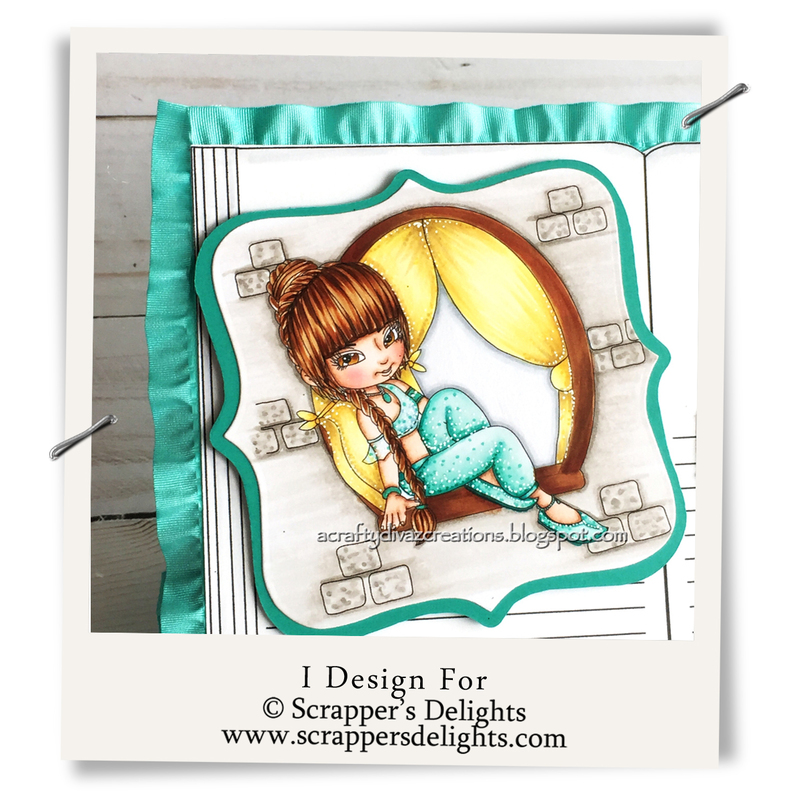 It's Inspirational Thursday over at Scrapper's Delights and I am sharing a easel card with you today. We are having fun with story time digi stamp which you find at the Scrapper's Delights online store. I added the genie to the book as page. I have to tell you, I am love with the way this card turned out. On the left side of the book page, I colored the image with my copics and used a die from my stash to cut out the image. I then added on the right side of the book page the die cut words from my stash. While I was working on this card, I knew I wanted to add some ribbon to the card but didn't know where. It came to me after I was almost done with the card to add the ribbon behind the book page. This added dimension to the card and I loved the way it turned out. I am going to send this card to a friend, I hope they will love the card as much as I love it. 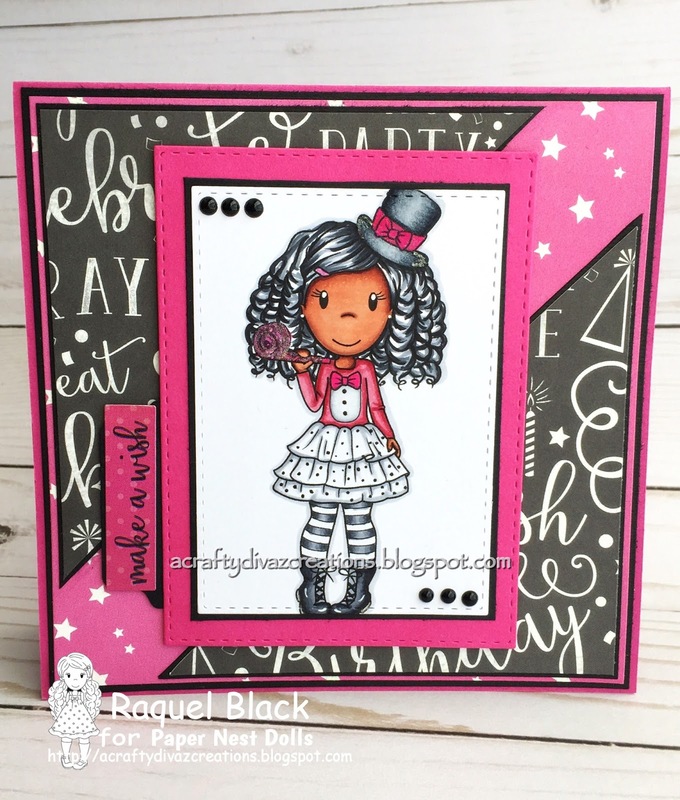 Check out what the other ladies created using the story time digital stamp over on the Scrapper's Delight blog. 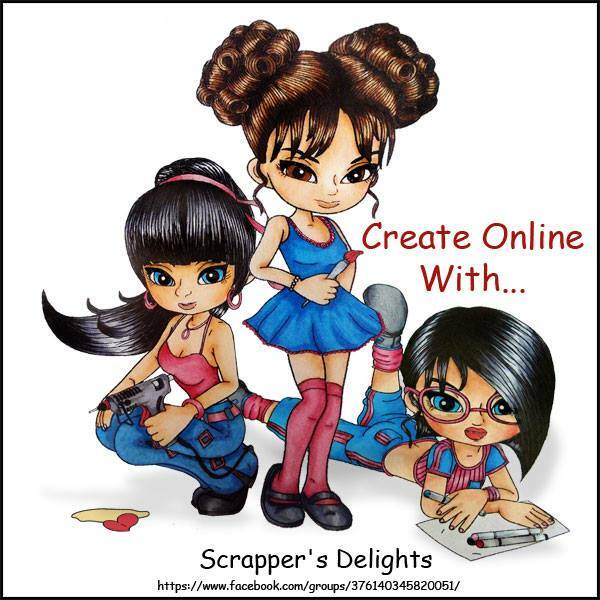 Don't forget to stop by the store and pick up some of the cute digital stamps. That's all I have for you now, thanks for stopping by. I will chat with you soon! Hello Crafty Peeps, hope your Tuesday is off to a great start. It's another challenge over at Crafty Sentiments Designs and this week's challenge is Anything Goes. Today's card share is using a new stamp Josh the sound which is apart of today's new release. 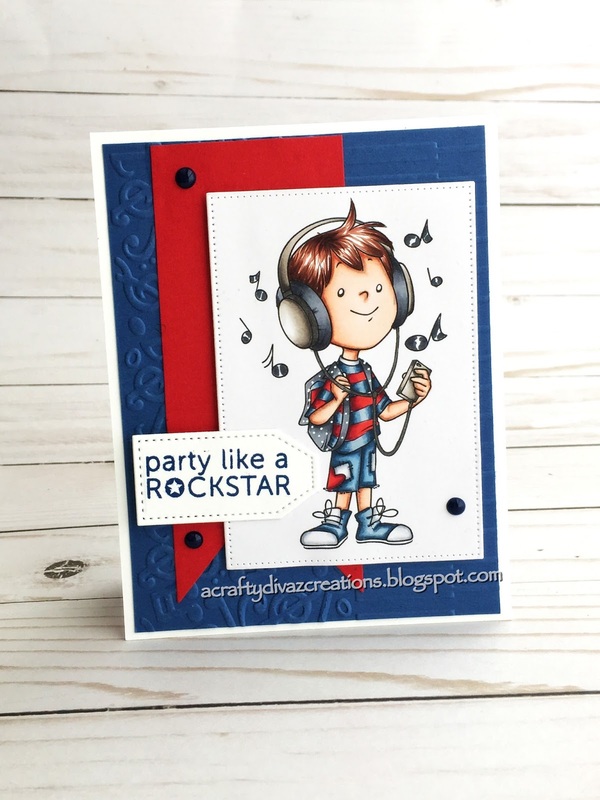 I just love this card, Josh looks like he is rocking out to his favorite music. I decided to create a standard A-2 card and layered blue card stock with embossed music symbols to match the music symbols from the stamped image. I added a red banner to the embossed layer and then added the colored image. I cut the image out using MFT stitched rectangle die. I colored Josh up with my copics and added the sentiment party like a rock star. I added some nuevo crystal drops to the card for added dimension. 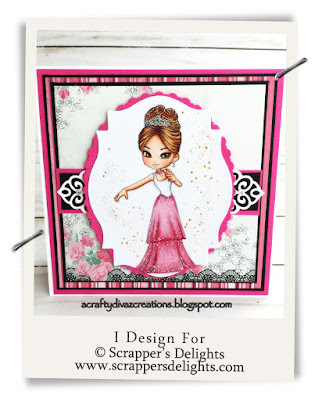 Definitely head on over to Crafty Sentiments Designs Shop and check out the new release. You will not be disappointed, I promise. Make sure you check out what the other ladies created over on Crafty Sentiments Designs Challenge Blog. 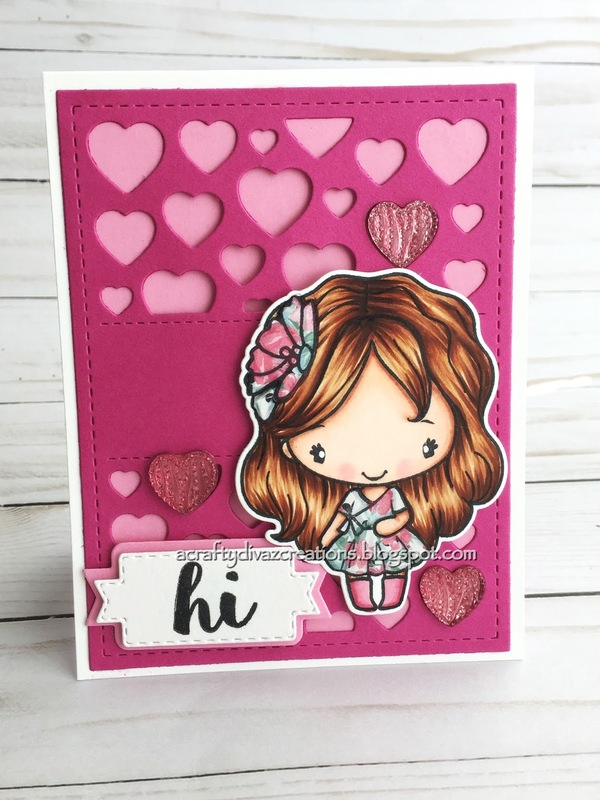 That's all I have for you today, thanks for stopping by and don't forget to check out Crafty Sentiments Designs new release. I will chat with you soon, have an awesome Tuesday!